December Spotlight Brewery- We have been checking our naughty and nice list and it appears you have all been very nice this year! So our gift to you is Spotlight brewing prices on Avery Brewing Company. Pettyjohn’s and Avery have had a long and lasting friendship that we would like you to be a part of. They brew awesome Craft Beer and we sell it. It is a pretty simple process but it is one we want to maintain. 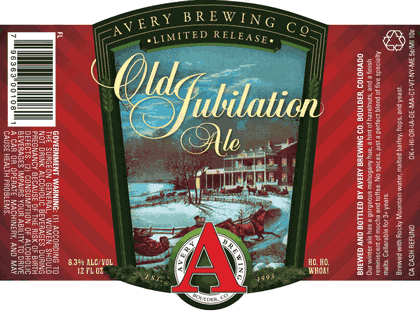 If you are looking for Old Jubilation it is now in cans only this year and it usually is sold out by the 10th of December. Yes, it is that good and that popular. We will have plenty of stock on the industry standard, Avery IPA, as well as Ellie’s Brown Ale, Out of Bounds Stout, White Rascal, and Joe’s Pilsner. Be sure to check out the new four packs, Liliko’I Kepolo. It is hard to pronounce, but it is so delicious. You can also try the new double IPA, Raja- a bitter, dry-hopped blast on your taste buds. There is a reason Avery is known for its IPA’s and this is one of them. Enjoy your gift from us- cheap Avery! Happy Holidays from Pettyjohn’s and thanks for buying Local Craft Beers for your next gathering of friends and family. We look forward to seeing you in 2016.